As part of an MA in Philanthropic Studies (undertaken at the Centre for Philanthropy at the University of Kent) I completed a study which aimed to identify the role that prospect research plays in major donor fundraising. The study involved a survey, undertaken in 2018, of major donor fundraisers and prospect researchers working in higher education institutions in the UK. I’m pleased to say that the results of the study are now available to download. In particular, the results can be used by non-profit organisations when analysing the use of personal data for prospect research purposes under the GDPR. Until now, the non-profit sector did not have a reliable evidence base which outlined the purpose or necessity of prospect research, nor which identified if the purposes of prospect research could reasonably be achieved by other methods (which do not use personal data) – all important areas to analyse, particularly for those organisations relying on their Legitimate Interests to process personal data for prospect research. In practical terms, the data and evidence presented in the paper can now be used by any non-profit organisation when completing, for example, a Legitimate Interest Assessment or a Data Privacy Impact Assessment. Beyond GDPR, the paper highlights that, on the whole, the prospect research community is not particularly good at gathering evidence which illustrates the impact (or the ROI) of prospect research. That said, it does also show that the vast majority of major donor fundraisers are overwhelmingly positive about the ways in which prospect research supports them in their work. If you think it might be useful for you or your organisation, please do download the paper and (when sufficiently caffeinated) have a read. I’d be more than happy to answer any questions or chat about the data/paper in more detail if you’d like to get in touch. We recently undertook a survey of prospect research teams in the UK to find out how they are coping with GDPR preparations. We’d like to thank each of the 95 respondents – your answers have given us a real sense of the current situation for the prospect research community as we all work towards May 2018. We thought it might be useful to share some of the responses as we know that many prospect researchers are struggling with GDPR and it may help to know that you are not alone! That said, it’s not all doom and gloom out there, as the answers to the survey reflect, and there are many positives that we can take from the results. Perhaps unsurprisingly, the overwhelming feeling from most of our respondents (77%) is that there is still a lack of clarity around GDPR – specifically around how prospect research can operate in a compliant fashion within the principles of GDPR. There are also concerns with the practical aspects of GDPR preparation; over 34% of respondents would like more information on undertaking a privacy impact assessment and 38% of respondents are struggling with understanding how to integrate GDPR practices with their CRM system. Frustratingly, almost 35% of prospect researchers reported that they have not been involved in the GDPR discussions at all in their organisations so they feel they have been unable to provide valuable input to the process. Whilst only 2% of respondents stated that they are ‘completely ready’ for GDPR, the vast majority of respondents, 91%, stated that, for prospect research at least, their organisations are ‘not quite ready, but getting there’. Only 4% of respondents felt that they are ‘not at all’ ready. Most interesting to note from the results was that 54% of respondents stated that their organisation will be relying on legitimate interests as their basis to process data for prospect research purposes. Only 3% noted that they will be relying on consent as their basis for processing whilst almost 35% of respondents stated their organisations were not yet to make a decision on this. Only 16% of respondents felt that writing privacy notices / policies was an area of concern for their organisations – this is perhaps due in part to the specific guidance that does exist in this area. Hearteningly, over 63% of organisations have updated their privacy notice to be GDPR compliant. Just over 26% have not yet done this, and 10% of respondents were not sure on the state of their organisation’s privacy notice. Of the 63% which have updated their notice, over half (58%) have now uploaded this to their website. Only 14% have taken the step to post or email this updated notice to their supporters but this number will inevitably grow at a pace as we work towards May 2018. We also wanted to find out whether researchers have been able to continue providing prospect research services in recent months as the answer to this may help us to understand the likely long-term impact of the ICO fines and GDPR preparation. The results below show the 5 main areas of prospect research activity and the % of respondents who stated they have either a) stopped doing this activity altogether, b) paused this activity whilst they prepare for GDPR, c) have continued to do this activity or, d) were unable to answer or didn’t do this activity in the first place. We have followed up specifically with those individuals who stated they have ‘stopped’ or ‘paused’ Database Screening to obtain more details on these decisions, and we will be able to provide more insight into this at our session with Prospecting for Gold at the RiF Conference on November 6th. For those unable to be at the conference we will follow up with a blog about this shortly afterwards. For now, it is heartening to see that, aside from Screening, the majority of prospect research activities have continued, although some have fared better than others. Due diligence in particular seems to have continued, with only 1% of respondents stopping this activity and 3% pausing it. Individual research (i.e. profiling), which was previously undertaken by over 92% of respondents, has stopped or paused in a quarter of organisations as GDPR preparation is undertaken. Network research was highlighted in the open questions as a particular area of concern, with many unclear how to balance GDPR requirements with the need to identify relevant contacts of key supporters, although of the 50% of respondents who previously undertook this type of research, 86% are continuing to do so, so it is unclear how much this has been affected in reality. It will be interesting to review the long-term consequences of organisations stopping or pausing these activities as we look in particular at major donor income in 2018 and beyond. Many respondents in the open questions highlighted their concerns that their particular organisations and institutions are losing opportunities to identify and engage potential supporters for fundraising during the process of preparing for GDPR. Whilst this is a worrying time, there was a view from many respondents that GDPR will ultimately have a positive impact on prospect research…in the end. So, the future seems bright but, in the present, if you are one of the many researchers who would like more clarity on specific issues, we know that the IoF are working to produce some specific GDPR guidance for prospect research. We don’t yet know when this will be available, but it will hopefully provide some much needed insight into how we can better prepare for GDPR. Whilst you wait for that, you may want to download our paper on legitimate interests and prospect research, as it signposts to other useful pieces of guidance and gives a basic overview of the GDPR situation. If you’d like more details on the survey or would like to chat about prospect research and/or GDPR, please do get in touch with me. Something quite remarkable happened a few weeks ago. I went to a conference on GDPR (the CASE Regulation and Compliance Conference) and, by the end of the day, I was actually feeling upbeat, hopeful and – even – vaguely excited about the future of prospect research. This was not at all how I was expecting to feel after a GDPR conference, based on the countless other GDPR conferences and events that I have attended over the past 18 months which have mostly left me feeling a mixture of despondency and frustration. So, why the sudden shift? Well, a few things. Firstly, the brilliant presentations were, for the first time, practical, focusing on what people are working on and achieving as they build towards compliancy for GDPR. To be at a GDPR event which was about positive action in regards to things like privacy notices or data analysis, and not just about all the things we can’t or mustn’t do, felt like progress. Secondly, there was a real focus on analysing the ‘legitimate interest’ condition for processing data for prospect research. This is a huge step forwards. For too long now ‘legitimate interest’ has been viewed as a second-best option, a condition for processing that non-profits can maybe use, which is kind of OK, but probably just not quite as good or as ‘safe’ as consent. Obviously, this is due in no small part to the Regulator and ICO’s view that non-profits should probably get consent for wealth screening (by which they seem to imply most forms of prospect research). Alongside this, as Adrian Salmon’s recent blogpost highlights, one of the problems of principles’ based regulation is that, whilst it should encourage flexibility, it tends to lead to a “very conservative compliance mind-set”. So, it was great to see the all the relevant conditions for processing being analysed in an informed and practical way at the conference. And lastly, many Higher Education Institutions (HEIs) are actively choosing legitimate interests (after careful analysis) as their condition for processing data for prospect research. This is another good, positive step. There is still confusion and misinformation. In the past two weeks alone I have received a number of emails from researchers who are still asking if wealth screening is illegal or if they need to get consent from all their donors before doing research. I also speak to many organisations that have suspended some or all forms of prospect research whilst they try to work out their next steps. Occasionally, I speak to smaller charities who have no idea that any of this is even happening. So, despite great advances in the HE sector and with some charities, it is clear that there is still a long way to go for prospect research before we reach May 2018, when GDPR becomes law. The main aspect which seems to be paralysing many organisations is the question of whether to rely on consent or legitimate interests as the condition for processing for prospect research. Many researchers have been tasked with coming up with a plan for assessing this and making recommendations, which is a tall order. Much has already been written about consent (see, for example, The Fundraising Regulator’s Guidance on Consent) and we thought, therefore, that it might be useful to add some thoughts around legitimate interests, specifically in relation to prospect research. Please click here to download our paper on this, which is a meander around the topic (you’ll be asked to subcribe to Factary Updates, so you’ll receive other reports and updates like this in the future). We hope the report is useful. Please do come back to us with any questions or comments. Also, remember that we are not data protection lawyers, so don’t make any decisions based solely on the information we provide! I sat in on a presentation by the Water4Life lab group. Here were a range of projects on water use and water management. One project was using data from Aigües de Barcelona, the Barcelona water utility, to pinpoint areas of poverty in the city based on how much water each household was using. The project was analysing mass data gathered for one purpose (water supply bills) and using it for another (mapping and understanding poverty). Which led me to think about the Information Commissioner’s current focus on public domain information collected for one purpose, being used for another. The team at Factary is working hard to ensure we are fully compliant with this new emphasis from the ICO. So this week we contacted one of our suppliers to check that their data was fully compliant. They told us that “…in light of the new GDPR legislation we are currently in discussions…” with suppliers. This is a leading data house that provides data drawn from Companies House. Their end supplier is Companies House. Before they made their data freely available to anyone, Companies House earned £8.7m in a year, selling it to data users. I have been registered at Companies House as a director since 1990. I have never, ever, had a letter from them asking me if it’s OK to publish my name and address in their register, and then to sell that data on to the big data houses. So who is the biggest supplier of publicly available data? Every day, millions of people in Britain type the name of a person – a celebrity, a footballer, a friend, a company owner – into Google. Google returns thousands or millions of results; “Theresa May” returns 24 million publicly available results this morning, ranging from press reports to biographic reference sites. I did not ask the Prime Minister if I might check her name in Google. I am certainly prejudicing her right to privacy by putting her name into Google, because thanks to Google I can see all sorts of scurrilous, unrepeatable stuff about our glorious leader. Google is a massive re-purposer of publicly available data. Data gathered for one purpose (selling newspapers, or adverts in scurrilous blogs) is re-purposed every single day by Google on behalf of its millions of users. This is where the contradictions in UK privacy legislation are crystallised. This is where the ICO is heading in its search for the right balance between legitimate interest and the rights and freedoms of individuals. I want to be a fly on the wall when the ICO knock on the door of number 6, Pancras Square, London N1, the UK headquarters of Google. That battle – between the ICO and Google – will be one to watch. The Information Commissioner, the Fundraising Regulator and the Charity Commission are due to meet fundraisers in Manchester tomorrow, on Tuesday 21st February, for the Fundraising and Regulatory Compliance Conference. The ICO have produced a conference paper for delegates to read prior to 21st, which can be accessed here. The paper, amongst other things, sets out the ICO’s view of data protection in relation to Database Screening and, it seems, prospect research – although, whilst it mentions ‘Screening’ specifically, the paper rather ambiguously only refers to other [research] “…activities such as profiling individuals”. We do need to get some clarification on what they mean by this but, from the context, it does appear to refer to researching donors and supporters using public domain sources and/or using information not supplied directly by the data subject (so, prospect research). The conference paper outlines situations in which such a policy must be communicated to a supporter, some ways this can be done, and even when it is not necessary / practical to do so. This is all useful and welcome information. We now hope that perhaps the Fundraising Regulator will issue some sample privacy policies at the conference on Tuesday that provide examples of the language that charities can use to comply with fair processing of data for fundraising. However, the paper then states that it is ‘highly unlikely’ that charities will be able to rely on legitimate interests as a condition to process data for Database Screening – specifically using third party providers or involving any personal data not supplied by the data subject – or for ‘profiling individuals’. Instead these activities will require explicit consent from data subjects. This is because, the ICO states, these activities are a) not ‘compatible’ with processing data collected from a donor at the point of donation and b) not within the ‘reasonable expectations’ of a donor. Please read the conference paper. Think about how it will affect you and your work and highlight any areas you feel are not clear. The conference on 21st February is a very important event and the questions we ask (and the answers we receive) about this paper are likely to have a long-term effect on fundraising and research. If you are not going to be at the conference on Tuesday, you can pass any questions that you may have about it directly to the ICO (send them to events@ico.org.uk and ask for them to be forwarded to the relevant dept). The ICO say in its paper for this conference that individuals are “highly unlikely to expect” certain types of data processing. In the ICO’s press release announcing the British Heart Foundation and RSPCA monetary penalties they are quoted as saying “millions of people who give their time and money to benefit good causes will be saddened…” to know that charities would ask them for more money. Does the ICO have evidence that shows what donors expect? There is, in fact, strong evidence to support the fact that processing of personal data for research is within the reasonable expectations of many donors; a recent study concluded that 78% of donors said that better research before they are approached by a non-profit is the most significant area of improvement in fundraising in the past 10 years. Therefore, if fair processing is adhered to and prospect research is within the reasonable expectations of donors, then can the ICO confirm that charities can rely on legitimate interests to undertake this type of activity? Breeze & Lloyd, (2013); Why Rich People Give. London, DSC. The paper for the conference says: “It’s legitimate for you to process personal data in order to properly administer donations received from individuals”. The paper suggests throughout, as highlighted above, that “administering donations” is the only purpose for which a charity would use data collected at the point of donation or at the point a supporter joins a charity database. It suggests, therefore, that fundraising (including the market research necessary for raising funds) is not a compatible purpose for processing donation information. As charities rely on fundraising to carry out their work, is it not within their legitimate interests to use data collected from supporters for fundraising purposes, providing that fair processing and the rules of PECR, the MPS/TPS/FPS etc. are all adhered to? The X named by our Board member is not a donor. We have no permissions or opt-ins or opt-outs. Can we look him up on Google or LinkedIn or Companies House without his permission? Given that we want to research a potential donor before she does this, whose guidance should we follow – that of the ICO or that of the Charity Commission? These are just some of the questions we feel require clarification from the ICO and we’ll be submitting these prior to the event. We will also be attending the event on Tuesday and we’ll report back on what happened as soon as possible afterwards through this blog. Please also keep an eye on Factary’s Twitter feed during the day as we will attempt, where possible, to Tweet any significant points or answers to any questions raised during the conference. I just wanted to say what a wonderful book you have written. It is a fascinating volume, full of interesting and well-researched material, and I have learned a lot by reading it. You have approached the subject with the rigour of a true academic, but you have written it in a very engaging and accessible style. I have come away with an overwhelmingly positive impression of philanthropy in Europe from reading your book, although you have also been very clear about the lack of information available in the sector. The fact that foundations are starting to be more open is a very good sign. I also think that, in the current difficult climate, the book provides a lot of encouraging messages for fundraisers – not least the fact that fundraising has been going on for a long time in Europe, and will, for sure, continue to do so. My warmest congratulations to you on this superb book. Chris Carnie is the author of “How Philanthropy is Changing in Europe”, published by Policy Press. He writes in a personal capacity. Thank you for your comments in the Factary blog over the last few weeks. Even the ones we disagree with. Because your comments – Adrian, Charlotte, Elizabeth, Finbar, Gareth, Jay, Jeremy, Jon, Julie, Luke, Nicola, Oliver, Peter, Philip, Sarah, Tim, – show the size of the gap between two camps. In one camp are the people who work with philanthropists in charities, universities, theatres and museums. These people know that in order to manage a relationship with a customer – in this case, a philanthropist – we need to do what the banks, the supermarkets, the accountants, lawyers, architects and many others do. We need to be able to access public domain information in order to understand our customer, and we know that we have a legitimate interest in doing so. Sometimes we are required to do this research – for example by our supervisors at the Charity Commission. Sometimes, we need to do this research before we have met the person. Which is why we have a range of controls, including legal controls and codes of conduct that set limits on this type of research. In the other camp are the people who believe that precisely this type of research is an intrusion into an individual’s privacy. That searching for a named individual in Companies House fundamentally affects the rights of that person. This is out of our hands now. The Fundraising Regulator and the Information Commissioner are putting together guidance that – we hope – will resolve this difference. So we are closing, for now, this thread of conversation. We are not going to take any more comments in this area, for now. The debate needs much more hallowed halls than Factary can offer – it should be taking place in Parliament, or at the NCVO, not in our blog. We have a job to do – to provide ethically sourced public domain information for our many non-profit clients, and we’d better get back to that. You are at a board meeting of your charity. Board member Jane mentions her friend Peter, and says he might be interested in making a donation. Peter, she says, is the owner of a large software company. Peter, to be clear, is NOT A CURRENT DONOR. He has not opted in or opted out or opted for anything at your charity. Back at the office you put Peter’s name into Google. It’s in your legitimate interests to do so, and Peter would expect you to do this. Turns out that Peter’s business is based in Newcastle. You are in London, so there is time and travel cost to consider if you are to visit him. You use Companies House to find out about Peter’s shareholding and the company’s profits. These figures help you estimate Peter’s gift capacity. Again, it’s legitimate for a charity to estimate the size of a potential donation before it decides to spend money on a visit to Newcastle. At an invitation-only event on the 21st of February, the Information Commissioner’s staff will tell charities and the Fundraising Regulator whether or not they can do this search. The future of philanthropy in the UK hangs on the ICO’s reply to this one question. Can a prospect researcher do the search outlined above? If the answer to the question is “No”, then high-value philanthropy in the UK will change dramatically. It will no longer be possible to use public-domain information to identify or understand potential donors. Charities, universities, museums, hospitals and theatres will have to stop, immediately, all proactive forms of reaching out to new high-value supporters. How will high-value philanthropists react? They will give less. When charities stop asking, people of wealth will stop giving, or give less and less often.This is not just an assertion – it is demonstrated by research. In “Richer Lives: why rich people give”, Theresa Lloyd and Beth Breeze report that 69% of rich donors give ‘If I am asked by someone I know and respect.’ Charities, from cancer research to the lifeboats, will have to adapt to a dramatic cut in their income. Some philanthropists will respond by setting up their own foundations. We know from Factary’s New Trust Update that they are already doing this in some numbers. They will manage their own projects via these foundations, meaning less money for mainstream charities. If the answer to the question is “No”, then the ICO is taking on not just the charity sector, but pretty much every business in the UK. Because every day hundreds of thousands of secretaries, assistants and marketing people do this exact search to check up on potential customers. Can that really be the ICO’s intent? If the answer is “Yes”, then the ICO is affirming prospect research. We CAN continue to research, understand, and evaluate potential donors and, with permission, actual donors. We will know the future of philanthropy in the UK on the 21st of February. Yes, I know I have. But that was pre-publication. Now I have an actual copy in my hands, so that means that the orders have started shipping from Policy Press. This is a book for practical people. It’s about how high-value philanthropy is evolving across Europe, so practical people in fundraising, in prospect research, in social investment, in policy making and in education will all find – I hope – useful information here. If you are a major donor fundraiser interested in why your donors keep asking about impact, you’ll find an answer here. If you are a private banker or wealth adviser who wants to understand why your clients keep on asking about foundations in France, you’ll find out why, here. If you are a policy maker wondering whether to recommend further tax relief for donations, then you’ll find the arguments here. If you are a prospect researcher, wondering where to look for potential supporters in Switzerland, you’ll find some answers here. And if you are the director of an NGO, wondering what your strategic priorities should be, you’ll find some suggestions here. The book includes case studies, detailed research, some how-to, and a bibliography of more than 300 sources and references in (count ’em, ladies and gentlemen) seven languages. Its focus is Europe, meaning that this is not about the UK + the Continent + Ireland – it’s about the Continent + Ireland, plus the UK. 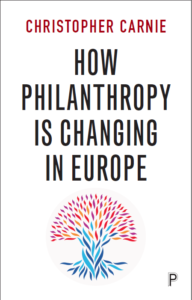 Order “How Philanthropy is Changing in Europe” directly from Policy Press, here. Prospect researchers are at the nexus of a storm between five government agencies. Thanks to the monetary penalties imposed by the Information Commissioner in December 2016 on two leading charities we can now see the extent of the battlefield. How would you find out whether “public concerns” have been raised, if you did not use “publically-available sources”? You simply have to use newspapers, government sources, and a search engine if you are to find out whether public concerns have been raised. There is no other way. And of course the Charity Commission says so, recommending that “full use should be made of internet websites” to check donors. The Commission goes further, and reminds trustees that “…if the trustees have reasonable cause to suspect that a donation is related to terrorist financing, they are under specific legal duties under the Counter-Terrorism Act to report the matter to the police. In the case of money laundering, reports can be made to the police, a customs officer (HMRC), or an officer of the National Crime Agency.” The Commission suggests a threshold for reporting – donations of £25,000 or more. That is personal information held in the public domain, that the Charity Commission requires us to review. Why are four government agencies – the Police, HMRC, the National Crime Agency and the Charity Commission – interested in these checks? In part, the story is linked to the London School of Economics, and the controversy over a gift from Libya. The result of the controversy was the Woolf Inquiry, which published its report in October 2011. After a detailed study of the history of this gift, Lord Woolf made a series of recommendations on accepting funds from “less well known” high-value philanthropists including an inquiry into the sources of their funds (p. 69) and a thorough due diligence assessment (p. 22). These searches are only possible with public domain information. Under questioning at last year’s CASE conference, ICO spokesperson Richard Marbrow did allow that we could use public domain information for due diligence purposes. But he went on to say that this same information could not be used for assessing gift capacity because that would be an “incompatible purpose” for the use of data. But that leaves us prospect researchers in Catch-22. I cannot carry out full due diligence on all my prospects. To do so would be a scandalous waste of charity resources. The Charity Commission suggests that the threshold should be £25,000. So if I am to decide that Mrs A or Mr B must be checked via due diligence…I have to assess their gift capacity. To do that, I need the help of a fifth government agency, Companies House. Mr Marbrow cited Companies House various times during 2016, telling fundraisers and prospect researchers that because the information in Companies House was collected for one purpose – regulation – it could not be used for another – prospect research. “Companies House is to make all of its digital data available free of charge. This will make the UK the first country to establish a truly open register of business information. Prospect researchers are caught in the centre of a battlefield between government agencies, between “innovative ways” of using information, terrorism legislation, due diligence and privacy. We must defend our corner of this bloody battlefield. We need our friends in fundraising and philanthropy, in Parliament and in civil society, to support the sensible, ethical, managed use of public domain information in the search for philanthropists. *I am grateful to a colleague at a leading University for pointing this out.